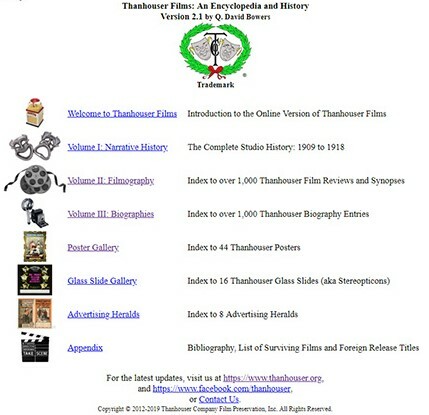 Thanhouser Company Film Preservation, Inc., is a non-profit 501(c)(3) organization involved in the research, acquisition, preservation and publication of educational materials related to the early silent motion picture era, with a specific focus on the Thanhouser film enterprise. From its founding in 1909 through 1917, Thanhouser Company, and its successor company, Mutual's Thanhouser Film Corporation, produced and released over 1,000 silent films to worldwide distribution. Want to learn more about silent films and preservation? Watch video tours of film archives around the world. Do you have film or digital media that needs transfer to DVD? Visit www.filmmaintenance.com to get this done! Thanhouser Company Film Preservation is a co-founder and proud sponsor of the International Youth Silent Film Festival. Copyright � 1994 - 2019 Thanhouser Company Film Preservation, Inc., All rights reserved.